I began competing in triathlons in 2009 after spectating and volunteering at Ironman Arizona. I was instantly hooked. I love everything about the sport: the athletes, the competition, and the supporting endurance community. Iron-distance triathlons appeal to me the most because it’s at these races where I truly feel like I’m pushing my body to its absolute limits. I love “digging deep” and seeing how my body reacts to the race’s harsh demands. Before triathlon, I was a competitive baseball player. I grew up in Seattle and am a diehard Mariners and Seahawks fan. I was a middle infielder for my varsity baseball throughout high school. I played the piano for 16 years and was also lead alto saxophone player for my high school jazz band (yep, I was a huge band geek). I moved to Arizona for college after living in Seattle for 18 years. I graduated with an accounting degree at Arizona State University and lived in Tempe, Arizona for 15 years before moving back to the Pacific Northwest with my wife (Becca) and two pups (Brownlee and Red). Before 2009, I never swam, bike, or ran. I am a very competitive individual. I have an “all-or-nothing” personality. I want to be the best. I have worked incredibly hard and have become an elite age grouper. 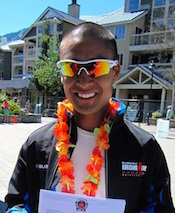 Most recently, I won my age group at Ironman Canada in Whistler. Over the past three years I’ve had the privilege of racing the Boston Marathon twice, 70.3 World Championship, and qualified for the Ironman World Championship in Kona two times. My long-term goal is to cross the finish line at Kona holding hands with professional triathlete Linsey Corbin. I am looking forward to using my knowledge and wisdom and helping others achieve their biggest endurance goals.